Fall and winter grazing on warm-season grasses is the least detrimental time to graze these species. Photo credit Troy Walz. Year-round cattle grazing is an important management consideration in the Nebraska Sandhills and western Nebraska. With proper protein and mineral supplementation, cattle can be successfully grazed on dormant winter forage without high inputs of harvested feeds. Although, some hay may need to be fed during heavy snows or if available forage is lacking. Saving forage on pastures for use during only winter months can provide a valuable source of feed. Additionally, if precipitation is adequate, there may be opportunities to utilize regrowth on pastures that were grazed early in the previous growing season. A question was recently asked if winter grazing affects herbage production during the growing season of the following year. Winter grazing tends to have minimal impacts on subsequent-year herbage production because most grasses are dormant at this time and plant carbohydrate reserves have already been stored in the roots and crowns of the plants. These carbohydrate reserves are what plants use to initiate growth in the spring until adequate leaf area is available to provide energy for plant growth. It is important to consider the time when grazing occurs in the plant growth cycle to ensure carbohydrate reserves are sufficient for growth in the following year. If moisture and soil temperature are adequate, upland pastures with large amounts of cool-season grasses may still have green and growing vegetation late into the fall. Growth on cool-season grasses this year has been observed well into November in many parts of western Nebraska. Grazing on cool-season grasses during active, late-fall regrowth can be detrimental to herbage production. A study in the Sandhills found that grazing in October reduced yields of cool-season grasses by 20 to 30 % compared to ungrazed pastures after 5 years of grazing. Warm-season grasses tend to have reduced subsequent-year yields when grazing occurs during their elongation phase in July and August. Fall and winter grazing on warm-season grasses is the least detrimental time to graze these species. As a result, pastures grazed only in the winter often have an abundance of warm-season grasses. Rotating the time of grazing on pastures so that fall or mid-summer grazing does not occur in multiple years will limit the likelihood of long-term negative reductions in cool- and warm-season grass production. There are usually limited opportunities for regrowth on warm-season grasses when grazing occurs after mid-July. 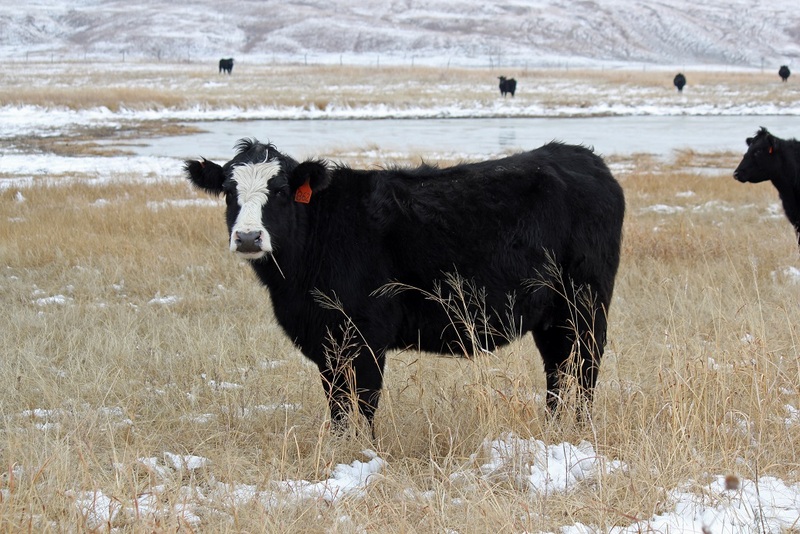 Return of cattle in the winter to pastures grazed from July through September should typically not be considered unless there is adequate forage availability. Only taking a portion of the annual forage allowance on these pastures during the summer months may offer other opportunities to graze the pastures later in the fall and winter. However, leaving some pastures with greater residual standing biomass following growing season grazing can provide important winter cover for wildlife, especially upland game birds. The general rule-of-thumb is to take half and leave half ( ̴50% total vegetation use), but if pastures are grazed in the winter, a slightly higher utilization rate ( ̴65% use) may be applied and not cause harm to subsequent-year herbage production. However, make sure grass stubble heights are typically no less than 3 to 4 inches and that there is sufficient litter ground cover. Leaving adequate residual forage and litter will reduce the risk of erosion and act as a “catch” for snowfall to increase soil moisture.